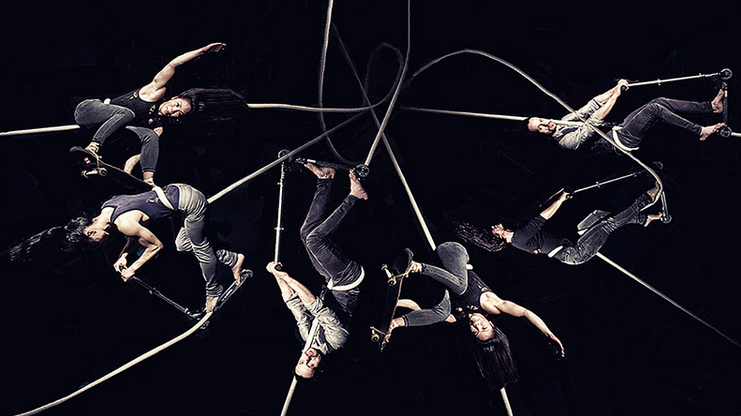 Presented by The Flying Xamels as part of the Melbourne Fringe Festival, 4 + 4 = 4 is a surrealist circus experience looking at four different lives, how the co-exist together and individually and who they are finding their way around. 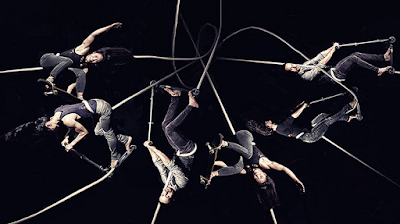 Four circus artists with four ropes perform as individuals and as an ensemble as a poignant metaphor on trying to fit in with life and following the right path. There is much to take in and analyse in 4 + 4 = 4, as the way these themes are explored can take on different and personal meanings for everyone in the audience. Fortunately the cast are all too aware of this and ensure that the tricks we see on stage are performed in a meditative and dream-like state. When you consider the technical aspects to some of the tricks, to be able to appear that calm actually requires great skill and confidence, which these artists possess to a high degree. But it is not just the performers who keep us entertained or transfixed on stage. Included in the mix in the back right corner is an artist drawing on pieces of paper on an easel and a camel that is perched atop the roof of the building dropping paper flowers down below. At numerous times, one of the circus performers jumps down from the railings and bounds head first through the artist's drawing, destroying the drawing and disappearing into the darkness. The drawings all seem quite pleasant with their cartoon-style presentation, but the images themselves evoke a feeling of manipulation and being overpowered. In one way, smashing through the drawing shows defiance to this and remaining true to themselves and living their lives their own way. Similarly, the action all taking place under the watchful gaze of the camel - representing focus, determination and travelling - is another symbolic example of the characters staying on task and track while undertaking their own personal journeying. 4 + 4 = 4 is circus that makes you question the way you live your life and to consider your place in the world in relation to those around you. Some mesmerizing and captivating tricks - with a well-matched soundtrack and lighting design - ensure you’ll be thinking about this show for some time to come. *Original review appeared on TheatrePress on 24 September 2016.